Are you wondering what Augmented Reality is all about? "Augmented Reality (AR)allows teachers and students to extend the physical world with a virtual overlay. Whether you have iPad, Android, or a smartphone, scanning a trigger in the physical world with an AR app allows a new layer of information to appear. This information could be a link to a web site, a video, an audio recording, or even a 3D model.." Quoted from EdTechTeacher: http://goo.gl/nP1Wi3. We invite you to join this 15 - 30 minute minute webinar to find out how to use this technology in your classroom. 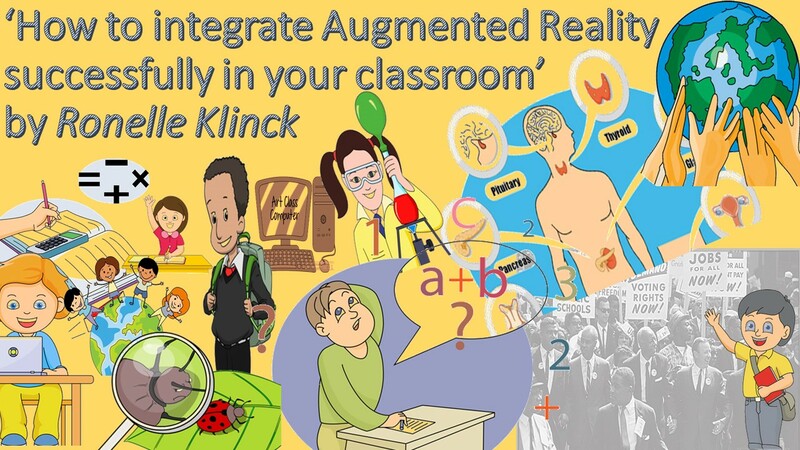 Summary: In this webinar, Ronelle demonstrates the steps to integrate Augmented Reality successfully in your classroom. Augmented Reality is a tool teachers can use to bring learning to life and make the learning experience an interactive adventure. Ronelle says, "I use AR to engage my learners, scaffold learning and flip my classroom. 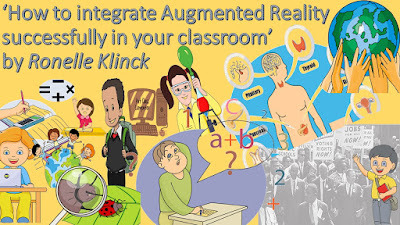 In this webinar I’ll share practical examples of how to integrate AR in your classroom." To join the meeting: Visit the event page created for this webinar at:https://goo.gl/1vEOR4 on the day of the webinar and click on the visible webinar link once there. Our second webinar of the season will be presented by Keshma Patel, Grade 6 teacher at Micklefield Primary in Cape Town on 25th August at 3:30pm. The topic is 'Exploring with Google Tours'. One of the things Keshma will be demonstrating is how to re-create a Vasco da Gama or Bartholomew Dias journey using Google Tours. There will be more information about this webinar in a later blog post. This is a guest post from 2Enable.org. "When we looked into teaching methods, the research absolutely upended our preconceptions. It basically showed that kids in rural spaces were hungry to learn and use technology. Chances were slim that equipment would be stolen, vandalised or misused - they were desperate to use what they were provided with in order to improve themselves." says 2Enable Founder, Michael Matthews. 2Enable.Org has just launched free live IPTV lessons using Skype Broadcast! Initially we are broadcasting Grade 10 to 12 Maths and Science lessons by Ms Candace Rennie, the former Head of Science at Rosebank Progress College. These lessons take place in the afternoons, Monday to Friday until November 2016. Learners are encouraged to register at no cost on www.2enable.org and enrol in the applicable subjects. Once enrolled, the link to the live lessons will show on their personalised calendar. A simple click on the calendar and a click on the broadcast will see them receiving a valuable 45 minute lesson. Alternatively, learners or teachers can keep an eye on our social media platforms, where details on the lessons will be published daily. A click on the link will take them directly to the broadcast with no need for a 2Enable profile or a Skype account. Missed the lesson? No problem. By following the same methods, learners are able to view a recording of the particular lesson. 2EnableOrg is a web-based application targeting education and NPO's in SA to help the sector and students achieve excellence for free. We deliver educational content using digital learning centres or any internet connected computer or computer network. 2Enable is an online educational platform developed by Casterbridge Music Development Academy (CMDA), a registered non-profit organisation. Our School in the Cloud, which is currently being populated with content and assessments, is designed to provide FREE academic and other meaningful educational content for the benefit of all South Africans using a variety of resources specifically aggregated for the platform. All curriculum aligned content is arranged in weekly modules with an online assessment at the end of each module. Currently mathematics and English first additional language grade 1 to 12 and physical science from grade 10 to 12 are loaded on the site. Natural science grades 9 and 10 and life science grades 10 to 12 are currently being added. Music theory, recorder, violin and guitar videos are already available to learners. SchoolNet talks specifically about the Gaming in Education panel discussion at Eduweek 2016 where Janet Thomson was one of the panelists. Koos then discussed his unique use of Minecraft with his university students studying BSc. Multimedia where they can earn rewards such as bonus marks and assignment extensions by completing challenges that he poses. However, the main purpose of requiring students to undertake challenges in Minecraft was for the purpose of developing a shared gaming vocabulary with his students once they have all played the same game. He highlighted the features of Minecraft Education Edition that provides teachers will the tools to create goals and set challenges for their learners. Ryan introduced Andreas ‘Cent’ Hadjipaschali and asked how he had managed to grow his company, Bravado Gaming, into the premier e-sports organisation in South Africa at age 29. Andreas’s response and interaction with Ryan is available here https://youtu.be/FOF4GcPb-Mw He provided the facts around just how big e-sports has become including it now being on DSTV Super Sport. 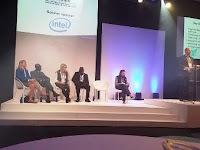 The panel discussion was concluded by Hitendra Naik, the Director of Innovation for the Middle East, Turkey and Africa at Intel who shared instances of gamification as applied in other industries and made special mention of Intel’s commitment to gender equity with My Digital Journey App for girls in Kenya and Intel’s She Will Connect initiative. 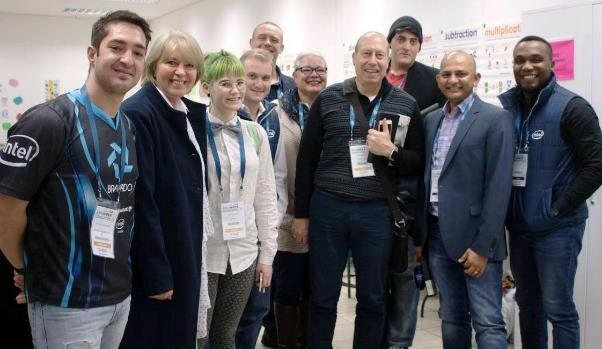 This is the first of a two part series reporting back on the recent Eduweek16 in Johannesburg. This year #EduWeek16 partnered with the SABC, the headline sponsor being Intel. Other major sponsors were Microsoft, Pearson and Dell. Educational exhibitors were there in large numbers (120). The conference theme was “Education for Sustainable Development” and the choice of parallel sessions was greater than in previous years. There were five choices of conference threads which included Early Childhood Development, Vocational and Higher Education, Inclusive Education, general basic education and Educational Technology. The Opening Plenary was well attended as can be seen from this photo above. Brian Gonzales from Intel, Jaye Richards-Hill from Microsoft and Maurice de Hond from Steve Jobs Schools (Netherlands) all preceded the closing remarks given by National Minister Motshekga. All the speakers were engaging but Maurice de Hond captured the imagination of the audience when he explained the reason he had opened his first school in the Netherlands. He had been compelled by the fact that his 7 year old daughter was about to attend the same school as his 30-something sons and the school had not changed in the least in those intervening two decades. He said if Bill Gates had died around the same time he might have named his school after him. He announced that he had just opened two Steve Jobs schools in Gauteng. This year, Steve Jobs Schools have been named Most Innovative Schools in the world by Tech-Insider Magazine. Maurice de Hond and Minister Motshekga are pictured here http://stevejobsschool.world/4221-2/ on the Steve Jobs schools website. The Awards Dinner was a glamorous affair, magnificently hosted by Hlubi Mboya, pictured below. A wonderful surprise was the Lifetime Achievement Award being won by Phuti Ragophala, Principal of Pula Madibogo Primary in Limpopo. Phuti magnanimously thanked SchoolNet South Africa, Coza Cares and Microsoft for all the support she had received during her digital journey. Brain Booster for Early Childhood Development as well as for the Innovation product award, Edit Micro Systems for Special Needs Education, The Reach Trust for the NGO award and Siyafunda Community Technology Centres for the Community Award. The Institution leader of the Year award went to Sehoole Moses Sello, Principal of Mankuroane Technical and Commercial Secondary who also won the Educator who Cares award and the Teacher of Tomorrow was awarded to Lindsay Wesner, ICT integrator and Subject Head of Life Orientation at Parklands College in Cape Town." This post will be followed by Part 2 where Janet Thomson talks specifically about the Gaming in Education panel discussion at Eduweek 2016. The Programming Olympiad is around the corner and your learners will be able to test their programming skills in any language that your school allows. 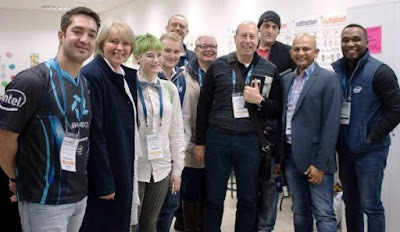 The aim of the Olympiad is to identify, encourage and reward computer aptitude, promote and encourage computer studies and create an awareness of career opportunities in ICT. The First Round of the Programming Olympiad will be open for participation from Monday 1 to Friday 5 August. Participants can take part for an hour at any time during that week. Learners may use any language allowed by the school including languages such as Scratch and Alice. These are introductory languages for Grade 10, but are also popular among Primary School leaners. The questions are available in English and Afrikaans. Schools can enter online at http://www.olympiad.org.za/register-programming-olympiad/ or request an entry form by calling 021-448-7864. Participation in the Programming Olympiad is free. For further information go to www.olympiad.org.za or contact info@olympiad.org.za or contact 021-448-7864. Holidays have started. Now is the right time for you as a teacher to enjoy your vacation and not think about work. However, as much as we would all love a year-long vacation, that’s simply not possible. Unfortunately, this one, like many before it, will pass by before you even realize it began. What often happens is that just when you fully start to relax, the holidays are over and the only thing you have left is the hope you charged your batteries for the new school year. If this scenario sounds familiar, don’t panic. To make sure you have some peace of mind while vacationing, you should plan ahead and think about how to start the next term prepared. That basically means organizing unfinished paperwork before it becomes a nightmare. So, what to do with all those papers that you left to pile up at home or your work desk (documents, school materials, tests and exams)? Well, you can easily repurpose most of them to save time when the new term starts. In the majority of cases those documents come in two forms: printed or scanned and stored in PDF. Whatever the case may be, there is simply not enough time in the world to manually transcribe each document. And that’s the last thing you’d want to do during a vacation. So, what do you in similar situations when you have the documents, but no way to edit them without retyping them word for word? Luckily for you, there are some free tools that can help. One of them is Investintech’s online PDF OCR service that lets you convert your scanned and native PDFs to completely editable Word files. That way you can be confident when digitizing your documents that your important work will remain on your computer and not on your desk. And you can change and edit the files when you find it convenient. Select a PDF file from your computer that you would like to convert. Type the email address to which you would like to receive your converted file. Simply press the Start button and you are done. Soon enough, you will receive an email with a link to your converted file. What is left to mention is that the tool is completely free, with no limitations to the file size or the number of conversions. It is completely web based, so there is no need to install anything on your computer. Also, it keeps your converted file as close as possible to the original document. With this tool, you will be ready for your classes and the next school term. To be honest, you will be so prepared that your students will wonder whether you’ve actually been on vacation. But only you and you little online helper will know the answer. Have a great vacation!